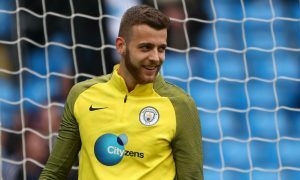 Manchester City are in talks with Southampton about selling England under-21 goalkeeper Angus Gunn in a £15million deal, Sam Lee of Goal reports. The highly-rated 22-year-old has been linked with a move to Marcelo Bielsa’s Leeds, but Alan Nixon of The Sun said earlier today that isn’t happened. And it has emerged that Gunn, who has already received a call-up to the senior England squad in his young career, could be heading to Southampton with the Premier League side in talks with City. With Ederson firmly established as number one, the Blues are ready to cash in on Gunn, but will insert a buy-back clause in any deal. Leicester City are also showing interest in the talented young shot-stopper, but Southampton are regarded as favourites to sign him having entered talks with City bosses.